Nourishing Facial Cleansing Wipes -- for dry skin is rated 4.9 out of 5 by 15. Rated 5 out of 5 by Cyril from Winner Facial Wipes My job requires me to wear makeup everyday so a very effective makeup remover is very important. 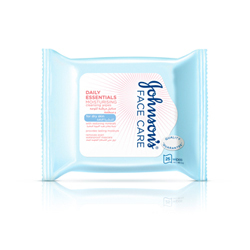 I have tried a lot of products in the past and got disappointed until I found Johnsons Face Care Nourishing Facial Cleansing Wipes for Dry Skin. It leaves my skin completely clean, makeup free and moisturized. Guaranteed can remove even your toughest waterproof mascara! I have recommended this to my friends and colleagues and they loved it too. A really must try and for keeps!